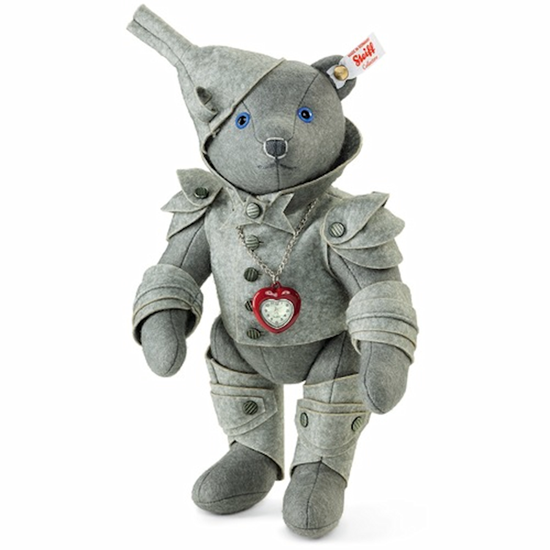 New in 2015 from Steiff's Wizard of Oz Series, The Tin Man is made of Grey Wool Felt and is a LE 1939. On her way to the Emerald City, Dorothy meets and befriends the Scarecrow and the Cowardly Lion. The three befriend the Tin Man after they find him rusted in the forest after being caught in the rain. They use his oilcan to release him and he tells them of his desire for a heart. The Tin man, who, with or without a heart, is all along the most emotional of Dorothy's companions. As part of Steiff’s hugely successful series of "The Wizard of Oz", the tender hearted Tin Man will add a very large spoonful of gentleness and endearment to any collection. A North American./UK Limited Edition of 1,939 pieces, the Tin Man is made of the finest Gray wool felt, stands almost 12 inches tall, is 5-way jointed, and was made in Germany. He is new in 2015.